White-shirted Jed Thistle showed absolutely no pre-festive kindess to Tynedale (picture by John Frater). 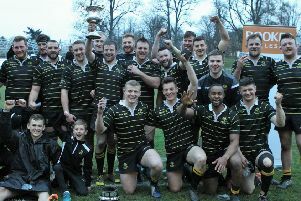 Following a defeat at Tynedale earlier this season, the Thistle lads were keen to prove a point – and that they did. The match got under way and the Thistle were soon on the hunt for the Tynedale line, which was found by Owen Cranston for the first try of the day, which he successfully converted. From the restart, the Thistle came hard at the Tynedale defence, with Elliot Lauder slipping through for the second try. Tynedale set up again for the restart, which was taken by the Thistle pack back into the Tynedale half. Another well-worked training field play saw Cranston in for his second try, again converted by himself. Play never moved out of the Tynedale half for the duration of the first half and the Thistle went on to rack up a further four tries, from Ross Nichol, Scott Murdoch, Elliot Lauder and Robbie Lauder, until Tynedale got their first glimpse of the Thistle line. A penalty to Tynedale on the Thistle 22 was awarded and some quick feet and hands from the big Tynedale number four allowed him to launch himself over the Thistle line to bring the score to 41-5. Half time was approaching – however, the Thistle had more points on their mind and some neat play through the backs saw Scott Murdoch head in for his second try of the day, to make the interval score 48-5. The second half got under way and Cranston was soon cracking open the Tynedale defence for another try. The Thistle were clearly to dominate this match through the strong attacking of the forwards and quick legs of the backs. A further three well-drilled tries were racked up in the second half by the Thistle, from Nichol, Cranston and Robbie Anderson. Approaching full time, the try fest looked all but over. However, the forwards began to pound the Tynedale defence one last time, with Max Purves hitting the line for his first score and points for the Thistle. A total of 13 tries and six conversions ensured a convincing win for the Thistle by 77-5. This weekend, Jed Thistle play Kirkcaldy Colts in an Inter District Challenge Cup game at Lothian Park, Jedburgh.